I found this handy online tool that calculates if you’re overloading the sockets and extension leads in your home. Click on the image of the overloaded socket below to go to the Electrical Safety First website and follow the instructions for the Socket Overload Calculator. 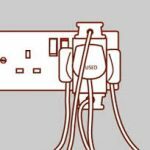 The site is packed with plenty of other useful information including advice on purchasing replacement power cables for your laptop, mobile phone or tablet.